Today, Victoria Stilwell was at McKamey Animal Care & Adoption Center talking about positive reinforcement dog training. She is an amazing speaker, trainer, and advocate. She also did a book signing-that’s me in the photo with her! You can click on the photo and it will take you to my flickr page with additional photos. Tonight was our second class at Play Dog Excellent. I just feed Lola enough so that she did not have to sit and watch Baby Girl eat her diner and feel left out. Instead of the hot dog for bait, I had cut up a little bit of the Natural Balance duck and potato food roll. So as great as Lola did last week, she bombed this week. The bait was crumbling into pieces and was just messy. Several times, she acted like she had never heard the word “Sit.” Nancy was so great to work with us after class on the down command. After what seemed like an eternity, Lola finally did it. Now for me to replicate the command at home! And once again, Baby Girl was mad that we took Lola somewhere without her. Last night was Lola’s first Basic Obedience Class at Play Dog Excellent. I had gone to the orientation last week so I knew what to bring as far as collar, leash, treats, etc. I got her all natural, kosher hot dogs and cut them into tiny pieces for bait (the training word for food rewards). They said not to feed your dog before class, but Andre’ did not know this and feed her dinner. Oh well, she was still Ga-Ga over the hot dog! Andre’ and I went for the first session-Sit, Down, Leave It, Take It, and Here. She did so great on everything except for Down. She was either not grasping the concept or just being stubborn. We were all exhausted after an hour of stimulation and commands. Baby Girl proceeded to punish us by ignoring us when we got home! Daily life with pugs: The key to living in peace and harmony with pugs is keeping a schedule. And exercise, exercise, exercise! Mornings: M-F we get up at 6:30am and the pugs immediately go outside to pee & poop. If you are on a regular schedule so will your pug’s body. On the weekends, we usually sleep late. Sometimes the pugs let me, sometimes we go ahead and get up and then go back to bed. This may be TMI (Too Much Information), but if you know that your pug always poops first thing in the morning and then they don’t one morning; this may be a indicator that something in off internally. Or if they start peeing more than usual, there again this may be an indicator that something is wrong. Breakfast: Our pugs eat their meals inside their exercise pens or x-pens. We have found that feeding them separately is the best option in our household. 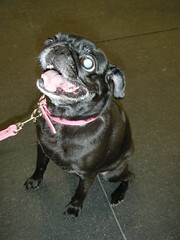 In the past, we have had pugs that had different dietary needs and required different medications. If you feed your pugs separately there won’t be any squabbles over food and you can monitor if they are or aren’t eating all of their food. Leaving the house: When we leave the house for work or just to run to the store, our pugs stay in separate x-pens. I know that some people are big fans of crating their pugs/dogs. We don’t because over the years, we have had rescues and fosters that came from backgrounds where they were kept in crates 24/7 and that was not a good environment to continue with them. I have no problems with crating your pug if that is good for you and them; we just don’t in our house. I do think that it would be beneficial if your pug were crate trained for traveling. Each pug has their own x-pen with their own bed and bowl of water. We leave a potty bad in with each of the pugs just incase they have to go before we get home. The reason that each pug has their own x-pen is that through the years we have had pugs in various medical conditions and from various backgrounds. Some pugs have well adjusted attitudes and some pugs have a tendency to get dominant. To be honest, I just can’t trust that one of my pugs would not beat up on the other while we are away. Dinner: There again, our pugs eat their dinner in their x-pens. Family time: This is my favorite part of the day when the pugs and I can hang out with each other on the couch or they will be at my feet while I am preparing dinner. This is when you can get in the floor and play with your pugs or you can snuggle up with them in the bed for an afternoon nap. Even if I am at my desk on the computer, it is nice to look over and see them napping next to me. Exercise: You may choose to exercise your pugs first thing in the morning (I’m not a morning person), in the middle of the day (I work), or in the evenings. What ever time is best for you, exercise your pug at an appropriate speed and distance for your pugs’ body and fitness level. Exercise will help keep your pug maintain a healthy weight. It is an excellent way to burn off extra energy for those younger pugs. And it is a great way for you and your pug(s) to get fresh air and get the blood circulating. Household: I never, ever, ever let my pugs have free reign over the house. Our ‘pug room’ is a converted garage with linoleum floors and that is where the pugs’ x-pens are and were their extra beds are scattered around the room. There is a baby gate separating this room from the rest of the house. This is where we have our desks and we spend most of our time on the computer with pugs at our feet. When I am making dinner, I like to have the pugs in the kitchen with me. We have another baby gate that separates the kitchen from the rest of the house. If I am on the couch with the pugs, we all hang out together. At no time do the pugs have free reign of our house!!! If you can’t see your pug, then you can bet they are getting into something that they aren’t supposed to or they are doing something that they shouldn’t. Letting your pug have free reign is just setting them and you up for failure. 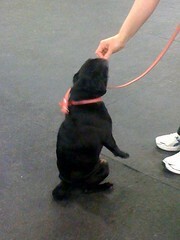 I have known people who had to leash/tether their pug to them while they were potty training their pug. I hope that some of this information will be useful for you and your pug(s) to maintain a harmonious life together. Remember that are no bad pugs, just owners that may need some help and guidance.